I simply want to make these at some point. I’m enjoying looking through Ms Monroes blog. Very awesome website and quite an inspiration woman. I’ll be stealing more recipes when I find them… Muwhahaha. To add to my every expanding list of new things to try. What’s the worst that could happen? 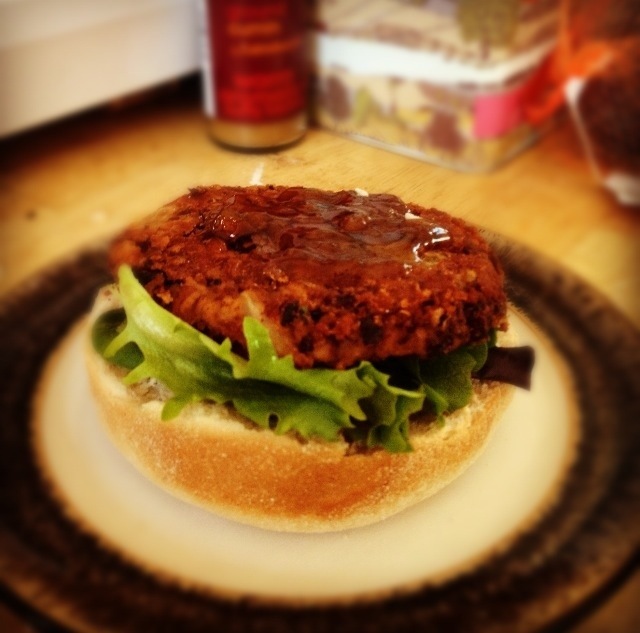 Carrot, Cumin & Kidney Bean Burger, 9p. With bread bun, perhaps with a bit of egg and bread crumbs and then freeze the leftover burgers for next time. This was today’s lunch – although the burger cost 9p to make (I’ve frozen the other three for days when I get home from work and want something quick and easy!) the salad, bun and chutney probably added another 15p to the meal price. However you could serve this with rice (3p for a 75g portion) or potato wedges (5p per potato) or whatever you like, really..! I had mine on top of half a white muffin (69p for 6) with a little salad and a dollop of mango chutney (80p for a large jar).